So I read an article about a school in Texas giving a kindergarten student detention for being late to school. Outrageous, right? I mean, who gives a six-year-old detention for being late to school? At that age, I was still trying to master the whole “bunny down the hole” shoe-tying concept, so how could I have been expected to provide my own transportation anywhere? How is a six-year-old accountable for that? Clearly this is a terrible policy instituted by a draconian school system. The administrators should be forced to change the policy, and the teacher who allowed this punishment should be reprimanded. If you read the comments on that story, you’ll discover that’s a recurring opinion: stupid school and awful, union-protected teachers. But let’s ask my favorite question: WHY? Why would a school system institute a policy that seems so obviously flawed? The answer is “AYP,” and you can thank your local congressman for it. AYP stands for “Adequate Yearly Progress,” and it’s a residual policy left over from No Child Left Behind. Basically, AYP is a series of measures that indicates whether or not a school or system is improving. It’s tied to allotments and funding, so it’s a big deal if you’re a teacher or principal who, you know, wants to keep your job. Most of the measures for AYP are test-related (surprise, surprise), but there are a few other measures that matter. For elementary and middle schools, one such measure is attendance. 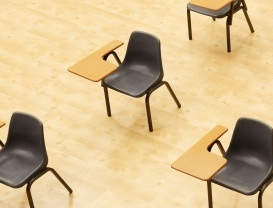 Yes, a school can fail certain sections of AYP if students are absent too often. Think about that for a minute. The SCHOOL can be penalized because students don’t come. In essence, by adding an attendance requirement to AYP, the government is claiming that a school can control when students show up. Again…really, really think about that. So if I’m the principal of a school in which students are tardy or absent excessively, you can bet I’m going to find some way to curb absenteeism…but what options do I have? “But wait,” you say, “this girl wasn’t absent. She was just tardy.” And yes, that’s true…but district policies on when a ‘tardy’ becomes an ‘absence’ differ. Early check-outs and late check-ins before or after a specific time are counted as absences, so if this girl was getting to school after that cut off, it wouldn’t matter; she’s considered absent as far as AYP is concerned. Brooke’s family would like to see Olympia’s policy changed to punish the parents, not the kids. Hmmm…holding parents responsible for things they control, and at the same time, not penalizing schools for something they cannot control? Sounds like a good idea. I wonder why no one’s ever considered that…maybe we need to add ‘common sense’ to the curriculum? Nah…we’d probably just try to cram that into AYP too. This entry was posted in Education Reform and tagged absences, accountability, ayp, education, education reform. Bookmark the permalink.